The second posting tonight in the 'Not PC: Architecture v Architecture' debate, the introduction to which is in this post below. Seen here is the first of the contributions from yours truly, one of my own top five. Architect Bruce Goff never designed to be published in magazines or to attract the bright lights, he never designed to be fashionable (he worked in Oklahoma, for Galt's sake! ), and he never designed to fit the 'malatropisms' of the so-called intellectual elite, whom he shunned as if they carried plague -- which of course in a sense they did (and do). Bruce Goff spent his life designing and working simply to delight himself and his clients. And so he did. No two Goff buildings were ever even remotely the same. I was introduced to him inadvertently by means of a wise-cracking insult by locally fashionable architect Ian Athfield, who had come up the hill to critique student work at Wellington's Victoria University. Seeing my own project he gave a snort of derision, muttered something about me and Bruce Goff which brought the house down, and moved on to look at something more post-modern from the student next door -- whereupon I left to find out about this chap I was supposed to be channeling, even if only in jest. What I discovered was that anyone channelling this guy was my kind of architect. Goff was apprenticed to an architect at twelve, and by eighteen had designed his first church. Not bad going, even back in those laissez-faire days, especially for an atheist. He worked through the war years as an army engineer, delighting in using found materials and 'borrowed' structures to do things with them for which they were never intended, such as this simple chapel built on the cheap using Quonset Huts. 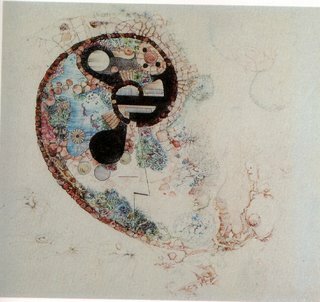 In later years he was to use all manner of 'found objects' -- his favourite story of this was to tell of an ophthalmologist client who insisted that after looking at eyes all day he didn't want any circles in his house: Goff designed him an angular house, with a wall interspersed with small, thick diamond-shaped clear glass panels. These were square one-dollar Woolworth's glass ashtrays Goff had bought and set on-point in the house's entrance wall. Goff's best work is this house pictured here, the Bavinger House. Built in 1955 for a young family in Norman Oklahoma, it brings together locally quarried 'ironrock,' mine tailings, coal rejects, glass cullets, airplane wire and a used oil-rig drilling pipe for the mast. The result is astonishing. The outer wall -- and in fact there is only one wall performing many functions -- seems to grow out of the ground before moving out and around to surround and enclose a garden and an adjoining living area before spiralling in an up to form and fix the climactic vertical pylon from which the roof and floor 'pods' are hung. The 'pods' are hung off the wall as it ascends, providing withdrawing, bedroom and study space that can be closed off with curtaining (don't ask, some writers suggest something about goose feathers) but mostly remain open to the whole glorious space in which they hover. Goff once wrote, “Beauty bursts forth when it must, because the Artist feels the drive within . . . and no amount of discouragement can stop him.” From America’s heartland, Goff transcended traditional ideals and proved to the world that architecture is an extension of nature, and the elements of sky, earth and water, its realm. 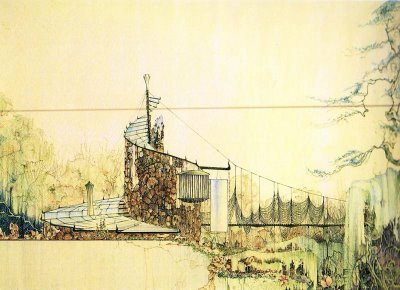 Bruce Goff's Bavinger House: Definitely one of my own personal top five. * Very 'imaginative' design: One continuous spiraling wall. * Has a very 'organic', nature-y feel: curvaceous as opposed to harsh lines. The 'rough' cobbled texture of the wall(s?) enhance the naturalistic feel. "seems to grow out of the ground"
* Ariel view (3rd photo) resembles foetus. Or an 'ear', or a bass clef. * Points off for a vague 'dislocated' off-centre feeling that living in a 'round' house would give me, i.e. no definite lines/planes and corners as reference points to orientate myself compass-wise. Also, I'm not a great fan of 'wires' - they remind me of telegraph lines that obscure a good view. Have a think about each piece you see and decide, first, "Is it good architecture?" and second, "Do I like it?" Will do so in future, but in fairness to DenMT, I judged his first building soley on "Do I like it?" criteria, so will do likewise for this building. Building 2 to you at lunchtime-ish again. Thank you both for this very interesting debate - I cannot see you agreeing at any stage, so please keep it CLEAN! and I look forward to seeing both your "exhibits and examples." I am no architect or critic, but have a love of interesting architecture or maybe it is an intense dislike for boring, stale, uninspiring architecture. I love this piece of architecture very much. It makes me want to live in it - experience the atmosphere of the unusual spaces that its shape has created. It would be a very interesting place to live in, especially with the fact that it IS part of its surroundings! I have had the privilege of visiting the Bavinger House twice. It is more amazing than any photos or drawings could predict. In fact I have often thought that architectural trends are highly influenced by the photographs of the buildings rather than the actual experience. The interior of the Bavinger House is impossible to capture in a photograph in the same way that simple rectilinear spaces are. 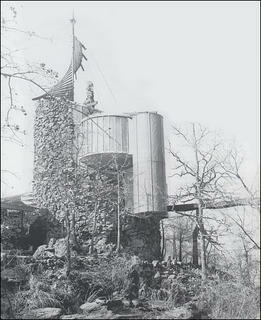 Bruce Goffs take off of the Bavinger House twenty some years later was a serpentine continous wall with three towers in on a ancient foothill mountain top of the Boston Mountain Range in Southern Illinois. With more rocks than I care to think about I do wish the original folks who built this had been into plants whereby Mrs. Bavinger surely had bragging rights on cleaning the place in a half hour via a water hose. I came accross this site while searching for info on their house. I agree with one of the posts - the photos barely explain this house, and interior shots would be very hard. Over the years, I've tried many times to describe this house to friends. By watching their faces, I can tell they usually don't follow me! 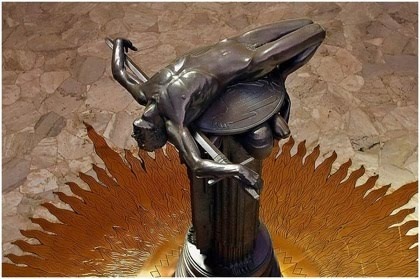 Once I spent the night there, and woke up with a fright - I opened my eyes and saw something just overhead. It was a piece of art that came out of the wall! My sister and her husband took me to the Bavinger House this morning. It is extraordinary. mike stated shin'en kan demise was due to neglect of the college of architecture at the university. the price family gave shin'en kan to the college in the 80's. i used to sketch the house. the college couldn't afford to properly maintain the property. it was sold for 400,000 dollars. if i remember correctly, it was to be used as a kind of country club with 4 like houses built around it. i know when the college of architecture had possession, many people worked hard restoring doors, windows and the ground, the people were students and faculty. the house had a caretaker as an occupant when it mysteriously burned to the ground. arson was suspected. bruce goff had morals charges brought against him in 1955. he lost commissions,(first baptist church, duncan) and resigned from the university. the glen harder house in minnesota also burned. i feel the arsonists are homophobic. david george craig,okc. Do you seriously believe that a homophobic arsonist burned Shinenkan down about 40 years after the incident mentioned? More likely is that someone developing new homes nearby on the Price estate hired some out-of-state pro to do the deed. That's what people closest to the matter believe. As for the Harder house, it fell victim to equipment malfunction, not arson.